If you are looking for grant funding for your innovation project, we can help you get it. Applying for grant funding, developing collaborations and writing bids can be an intense and sometimes difficult process for organisations to do alone. We have built an extensive understanding of the UK Funding landscape, so are able to support you with your application for funding wherever you may currently be in the process. the Advanced Propulsion Centre, Aerospace Technology Institute, Innovate UK and Meridian Mobility Technology. Find out more about some of the funding bodies we work with below, or review some of the latest funding calls that may be right for your upcoming project. The UK’s innovation agency. 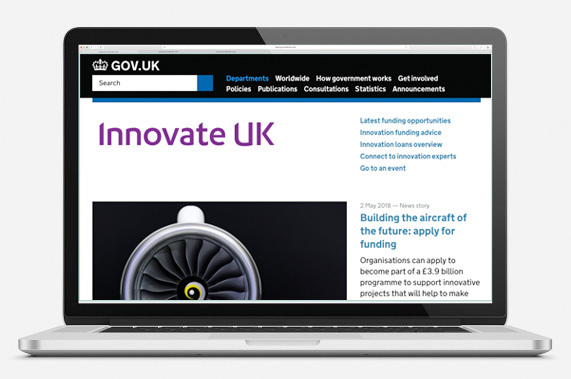 Funding available for people, companies and partner organisations to find and drive the science and technology innovations that will grow the UK economy. Competitions are available throughout the year. Positioning the UK as a global centre of excellence for low carbon propulsion development and production. Funding automotive companies with innovative low carbon propulsion technology, or those seeking it as a product in the UK. A joint Government and Industry investment that seeks to maintain and grow the UK’s competitive position in aerospace design and manufacture. Funding available for organisations addressing large scale technology & capability challenges. Meridian creates the collaborative environment for relevant sectors and industry stakeholders to innovate and test CAV technologies, products and services. There’s much more to writing and submitting an application for grant funding than organisations can initially think. Depending on the funding source you are applying to, there are varying levels of complexity, criteria and guidelines involved that need to be carefully considered.